The term Ruby originates from the Latin ‘Ruber’ which translated quite literally means red. The beautiful Ruby gemstone is instantly recognisable for its rich and sumptuous red hue. Rubies have been long regarded as a prized, precious and sacred gemstone, their importance and value is prominent or centuries throughout History in both Western and Eastern culture. 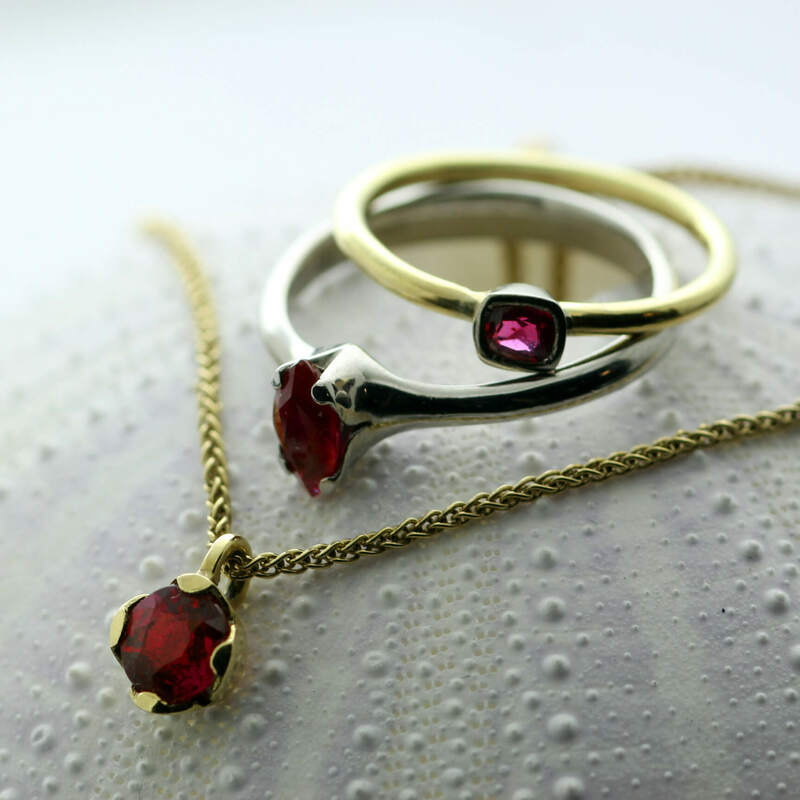 Modern jewellery designs handmade by Julian Stephens featuring July’s Birthstone, the Ruby. This long-standing love affair we instinctively have with the precious Ruby is understandable, this natural gemstone possesses many alluring qualities including; its rarity, an exceptional lustre, excellent durability, the Ruby is ranked just beneath Diamond on the industry standard Mohs Scale which categories the hardness of gemstones. The stunning reflective qualities and rich colour of this gemstone, combined with its hard-wearing properties make the Ruby an ideal gemstone for use in jewellery, and the ideal choice for creating memorable and timeless rings. Ruby technically describes the mineral Corundum, the very same mineral found in Sapphires, which are effectively the twin sister of the Ruby Gemstone. The difference in colour and therefore gemstone type is caused by geology, Rubies are formed when Corundum atoms are substituted with Aluminum and Chromium which cause the distinctive ruby red colour. A similar process involving traces of Titanium and Iron create the vibrant blue hues found in Sapphires. Geologists find the formation of Rubies something of a natural wonder, this process is something of a rarity, occurring in a few very specific, localized parts of the world. The majority of naturally occurring Rubies contain unique characteristics like colour impurities or inclusions, rather than devaluing this precious stone, these features offer an easy indication of a natural (and more valuable!) gemstone. Synthetic Rubies contain none of these distinguishing features and a perfect, clear example of a natural Ruby is incredibly rare and therefore extremely valuable. Rubies are famed for their rich and deep blood red tones, the finest examples of stones displaying these colours are typically found in Burma (Myanmar) and this sought-after rich red colour is described as “Burmese Ruby” or “Pigeon’s Blood Ruby”. 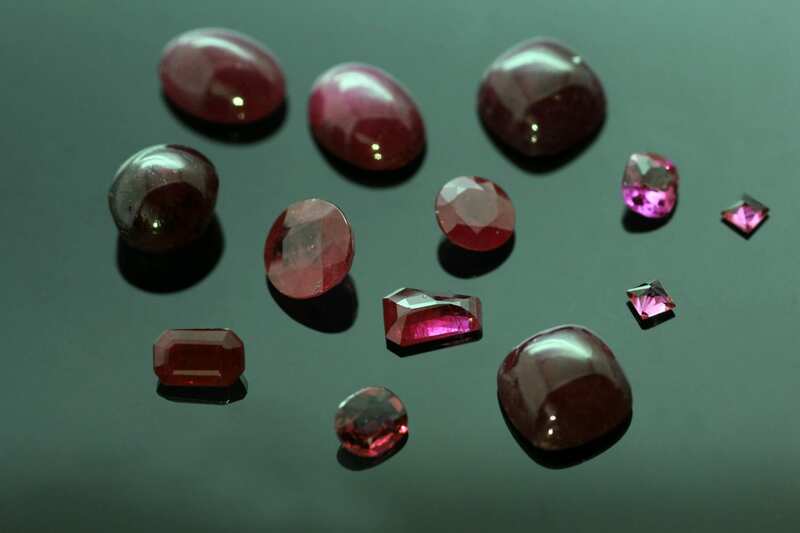 Another popular type of Ruby gemstone is a “Star Ruby” which describes a stone containing inclusions of tiny parallel Rutile (a specific mineral that causes unique Optical effects within a gemstone) needles within the Ruby, causing a polished example to exhibit Asterism (the term which describes the appearance of a star-like pattern on the surface of a gemstone once it has been cut.) These unique and sparkling Star Rubies can be found in six and twelves ray stars formations and can be used to create truly magical pieces of Fine Jewellery. Ruby is one of the most historically significant coloured stones. Rubies are mentioned four times in the Bible, in association with attributes like beauty and wisdom. In the ancient language of Sanskrit, ruby is called ratnaraj, or “king of precious stones”. In the first century AD, the Roman scholar Pliny included rubies in his Natural History, describing their hardness and density. Ancient Hindus believed that those who offered fine rubies to the god Krishna were granted rebirth as emperors. In Burma (a ruby source since at least 600 AD—now called Myanmar), warriors possessed rubies to make them invincible in battle. In order to gain this ability these soldiers would have to insert the stones into their flesh! Ruby retained its importance with the birth of the western world and became one of the most sought-after gems of European royalty and the upper classes. Many medieval Europeans wore rubies to guarantee health, wealth, wisdom and success in love.